5.0amp 12v DC regulated power supply with 4 way DC splitter attached. This power supply has a 5 amp maximum output. On one end of the power supply there is a mains plug fitted and on the other there is amn industr standard 4 way DC Splitter, each plug measures 2.1mm. This type of power supply is used to power up 4 cameras all at once. This means that you only have one plug connected the mains instead of having one for each camera (four plugs). 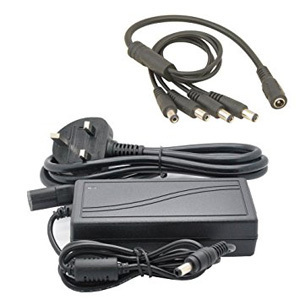 Suitable for powering up any TVI, AHD, CVI & Analogue CCTV Cameras as long as the camera is 12V.